The previous week brought us some huge upsets including the Buffalo Bills’ 27-6 victory over the Minnesota Vikings on the road, although the host were 17-point favorites to win the game. We saw everything is possible in NFL, but there are some interesting betting trends for the upcoming Week 4, so let’s check out the best betting picks for this Sunday, September 30th, 2018. The San Francisco 49ers lost their franchise quarterback Jimmy Garoppolo for a season due to a torn ACL which is a massive blow for Kyle Shanahan’s team. C.J. Beathard will start under center, so the visit to LA looks like an uphill challenge for the 49ers who are 11-point underdogs against the Chargers, and San Francisco is 0-10 in its’ last ten outings as a double-digit underdog. Likewise, the 49ers are 1-7-0 ATS in the previous eight road games in September and 2-4-0 ATS in their last six games overall. The 49ers are 1-5-0 ATS in the last six outings against the Los Angeles Chargers, and without Jimmy G, they will have a tough task to disrupt these betting trends. 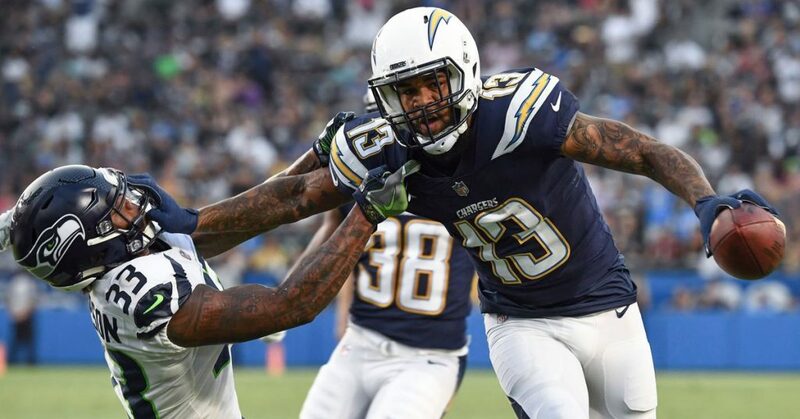 On the other side, the Los Angeles Chargers are 10-5-0 ATS in their last 15 games overall, and 4-2-0 ATS in their previous six games at home. Also, the Chargers are 5-2-0 ATS versus the team with a losing record, but only 1-5-1 ATS in their last seven games in September. The Chargers lost two out of their first three games this season, but both defeats came against on-fire Kansas City Chiefs and Los Angeles Rams, so this should be a great chance for another victory. Last Monday, the Pittsburgh Steelers won their first game of the season beating the Buccaneers 30-27 on the road, but once again, they showed a lot of defensive drawbacks that certainly worry their head coach Mike Tomlin. The Steelers are allowing 30.0 points per game to their opponents which is the fifth-worst record in the league, while they are permitting 288.0 passing yards per contest, also the fifth-worst record in the NFL. Fortunately for the Steelers’ fans, Ben Roethlisberger is leading their attack, so all three Steelers’ games in this campaign have been finished in the over, while their five previous outings were ended in the over. The Steelers are 1-4-0 ATS during this stretch, and 0-5-0 ATS in the last five games at home, so the bettors who like to wager against the streak should try with the hosts to cover the 3-point chalk here. The Ravens started the season with a 2-1 record, 2-1-0 ATS, and two of three games were finished in the over. The over is 10-5-0 in the Ravens’ previous 15 games overall, while six out of their last eight road games were finished in the over. They averaged 292.0 passing yards per game in the first three weeks, so we could easily see a high-scoring affair here. After surprising the Minnesota Vikings last Sunday, the Buffalo Bills are ready to make another surprise this weekend when they visit the Packers at Lambeau Field. The Bills are 4-2-0 ATS in their last six games on the road and 8-12-3 in their previous 20 games away of home. They are 6-3-0 straight up and 6-2-1 ATS in the last nine H2H meetings with the Green Bay Packers. On the other side, the Packers are struggling defensively at the start of the season, allowing 27.7 points (23rd in the league), 124.3 rushing yards (26th in the league), and 262.3 passing yards per game (22nd in the league). Hereof, it’s not strange that all their three games so far were ended in the over, while eight of the Packers’ previous nine outings were finished in the over. The Packers are 1-5-0 ATS in the last six games overall, and 2-5-0 ATS in the last seven games at home. The over is 9-4-0 in Green Bay’s previous 13 home games, and considering all weaknesses in Green Bay’s defensive play and offensive line, too, I’m backing the over on this one. The Detroit Lions are back on the right track after 0-2 start of the season, beating the New England Patriots 26-10 in front of the home fans, while the Dallas Cowboys suffered their second loss of the season, losing 24-13 at the Seattle Seahawks. Both teams are struggling offensively, especially the Cowboys who are averaging 13.7 points per game which rank them 31st in the NFL, while all three Cowboys’ games were finished in the under. The Lions are 5-2-0 ATS in the last seven games overall, eight out of their last 12 games were finished in the over, whilst the total has gone over in five out of their previous seven road games. On the other side, the total has gone under in the last five Cowboys’ games overall, and the under is 5-1-0 in Dallas’ previous six games on the home soil. On the other hand, four out of the last five H2H meetings in Dallas were ended in the over, and six out of the last seven H2H duels were finished in the over. Therefore, I think this is a nice chance for the bettors to see the first over in Dallas’ games this season. The Cowboys will have to improve their offense, and playing against the Lions’ defense that allowed 29.3 points per game could be a perfect opportunity to get some scores. The New Orleans Saints are allowing 34.3 points per game to their opponents which is the worst record in the NFL, while they are permitting 421.0 total yards per contest which rank them 30th in the league, but the Saints have suffered just one defeat in the first three games. The main reason is a phenomenal Drew Brees who threw for 1078 yards and eight TD’s so far without turning the ball over, while on last Sunday, he set the NFL record for the most passes completed (6,326) to surpass Brett Favre on the top of the list. On the other side of the field, we’ll see the Giants whose defense allowed 20.7 points and 232.0 passing yards per game, 343.3 in total, so this could be another chance for the Saints’ offense to put numbers on the scoreboard. Likewise, the Giants have some dangerous weapons in Eli Manning, Odell Beckham, and Saquon Barkley, so they could blossom against the Saints’ defense. New Orleans is allowing the third-most passing yards in the league, and Odell Beckham had a couple of 100-yard receiving games in the last two weeks. The over is 5-1-0 in the Saints’ last six games overall, and 4-2-0 in their previous six outings on the road. Likewise, the over has gone over in four out of the last five H2H meetings. The total has gone under in four out of the Giants’ last five games and last five outings at home, so this is a nice opportunity to improve theirs over record.